@PhilOnEdTech was the agenda of the Gates Summit online at all? Gates has also funded SRI International to provide independent research on the results of each grant. 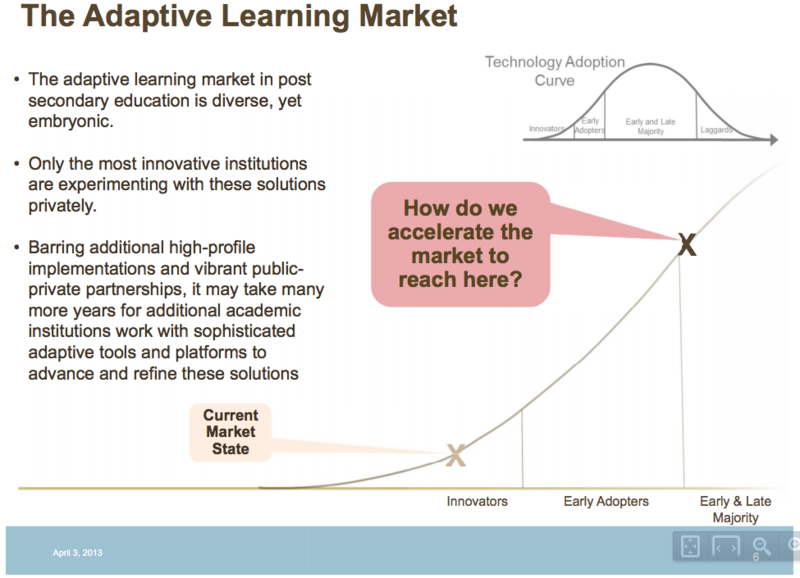 The concept of accelerator as used by the Gates Foundation is to push adaptive learning past the innovator’s adoption category into the majority category (see RFP webinar). The meeting was organized around quick updates from most of the grantees along with panels of their partner software providers (Knewton, ALEKS, CogBooks, Cerego, OLI, ASSISTments, Smart Sparrow), faculty, and several local students. Here is a summary of the meeting agenda. Adaptive Learning is becoming a hotter topic in higher education recently, and I expect that we will hear more from ALMAP as the results come in. In the meantime, here are some preliminary notes from the meeting (some are my own, some are group discussions that struck me as very important). Despite the potential importance of this funding program, I can only find one full article (outside of Gates publications) about the program. Campus Technology had an article in April titled “The Great Adaptive Learning Experiment”. David Wiley referred to the program in his take on the risks of adaptive learning. Scientific American (among a few others) described ALMAP in one paragraph of a larger story on Adaptive Learning. We really need a taxonomy to describe Adaptive Learning and Personalized Learning as both terms are moving into buzzword and marketing-speak territory. During the break out groups, it seemed there was unanimous agreement on this problem of a lack of precise terminology. 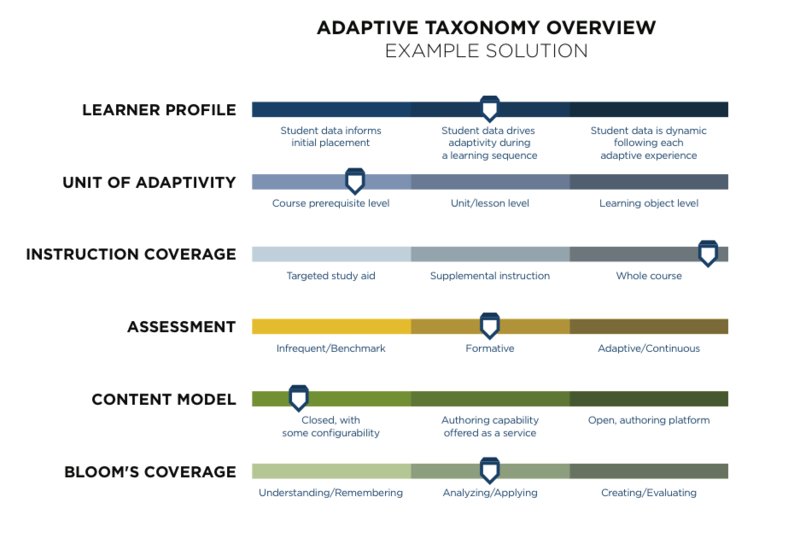 While the Gates Foundation also funded two white papers on Adaptive Learning, I did not hear the ALMAP participants using the embedded taxonomy (see below) to improve language usage. I’m not sure why. I provided a short start in this post before EDUCAUSE, but I think Michael and I will do some more analysis on the field and terminology soon. Michael also has a post that was published in the American Federation of Teachers publication AFT On Campus, titled “What Faculty Should Know About Adaptive Learning”, that is worth reading. The above problem (lack of accepted taxonomy, different meanings of adaptive), along with faculty flexibility in determining how to use the software, will make the research challenging, at least in terms of drawing conclusions across the full set of experiments. SRI has its work cut out for them. There appears to be a divide in the vendor space between publisher models, where the content is embedded with the platform, and a platform-only model, where content is provided from external sources. Examples of the former include ALEKS, Adapt Courseware and OLI. Examples of the latter include ASSISTments, Smart Sparrow, CogBooks, Cerego. Cerego might be the only example where they provide “starter” content but also allow the user to provide or integrate their own content. Credit to Neil Heffernan from WPI and ASSISTments for this observation over drinks. Programs of this type (pushing innovation and driving for changes in behavior) should not be judged by the first semester of implementation, when faculty are figuring out how to work out the new approach. Real results should be judged starting in the second semester, and one attendee even recommended to avoid results publication until the third semester. This is the primary reason I am choosing to not even describe the individual programs or early results yet. Kudos to the Gates Foundation for including a student panel (like 20MM Evolve and upcoming WCET conference). Below are a few tweets I sent during this panel. Student on panel: Profs matter a lot – could tell the ones who don't like teaching. Ones who love teaching are contagious, her best classes. Expect to hear more from e-Literate as well as e-Literate TV not only on the ALMAP awardees and their progress, but also from the general field of personalized and adaptive learning. Below is the taxonomy provided as part of the Gates-funded white paper from Education Growth Advisors. Update: I did not mention the elephant in the room for adaptive learning – whether software will replace faculty – because it was not an elephant in this room; however, this is an important question in general. At the ALMAP meeting, I believe that most grantees had faculty members present. From these faculty members (including a panel specifically on faculty experiences), there were discussions about changing roles (“role is facilitator, coach, lifeguard in a sense”), the fact that faculty were requested to participate rather than initiate the change, and the challenge of getting students to come to class for hybrid models. One faculty member mentioned that the adaptive software allow more instruction on real writing and less on skill-and-drill activities. But the way the grantees implemented adaptive learning software was not based on replacing faculty, at least for this program. 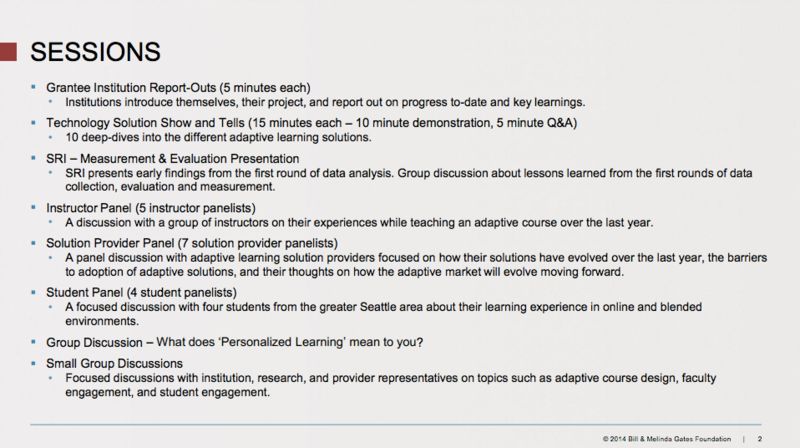 The post Adaptive Learning Market Acceleration Program (ALMAP) Summer Meeting Notes appeared first on e-Literate.